Home Cat Care Caring For Cats How to Enjoy Giving Cats a Bath? Cats are well- equipped to clean themselves on their own. They are born with grooming tools that help them keep clean. Their in-built grooming tools are their tongue and teeth, with which they constantly keep licking their fur. Cats spend more than 40% of their daily time on grooming and they are quite experts at cleaning. They use their barbed tongues to lick any dirt and debris off their furry body. This regular activity of cats keeps them clean and odor free. Domestic cats have evolved and dislike water unlike their cousins in the wild. In the wild other species of big cats enjoy their time in water because they stay in hot and humid weathers. A small dip in water helps keep their body cool. Domestic cats have coats that absorb water rather than deflect moisture making them difficult to dry themselves. Why giving cats a bath is essential? Domestic cats do not need running water to clean them. Regular grooming by cats helps keep them clean and shiny. However, there are few occasions where you may need to bathe them regularly. When your feline friend’s fur is soiled due to litter, whenever there is excess oil on them, or after having a rough fight with another cat, etc. you may need to give them a nice bath. You will have to give a bath when there are fleas on their body. Before giving your cat a bath, keep all the necessary supplies handy. 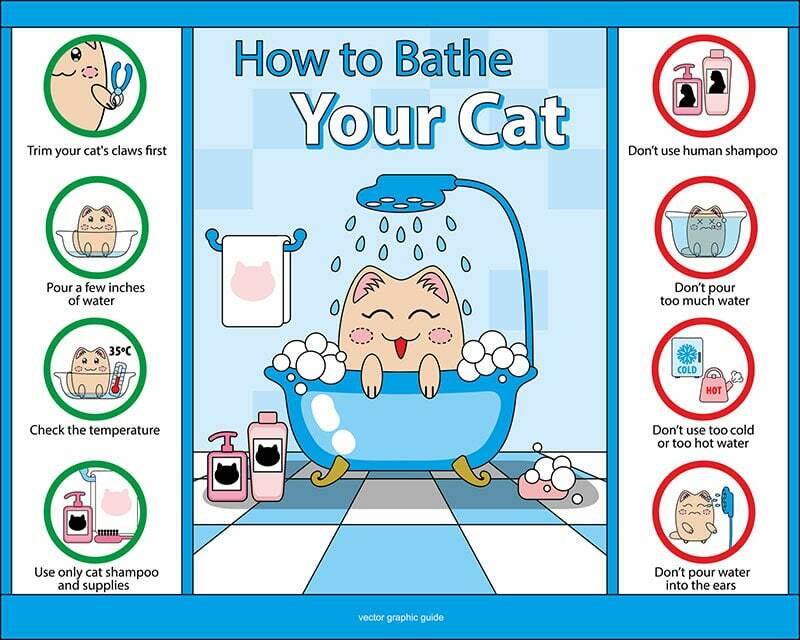 Schedule the bath when your cat is in good mood. Playing before a bath with a toy will make your cat tired and drain out his energies for some time. The bathing session can be stressful for both of you, so be prepared and follow a few important rules. 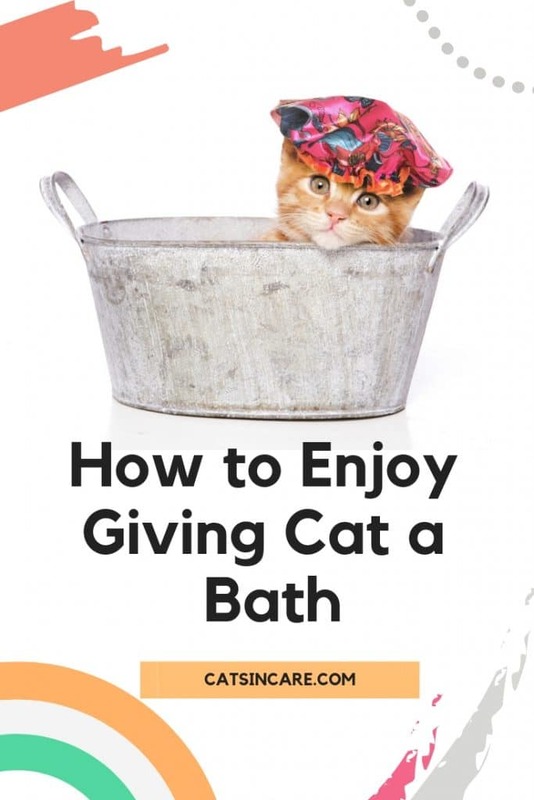 Bathing cats can be easy if you have anyone to help you around. One can hold the cat and the other can give bath. Take your cat to the bathroom and close the door to prevent it from escaping. Try to keep the noise levels down. Fill the water already in the tub before you bring your cat to the bathroom and make sure the water is not too cold and not too hot. 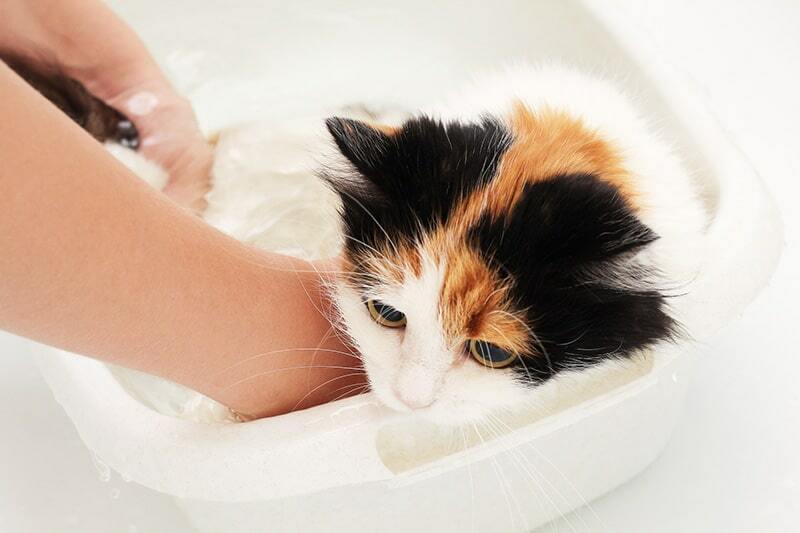 Place a rubber mat in the tub to enable your cat to grip when it is scared or nervous. Use a shampoo recommended for cats and the required grooming equipments. Never wet the cats head instead use a moist towel to wipe his face and head only if you notice dirt on them. Gently pour water from the tub with a cup from neck and gently start applying shampoo. Wash the legs later. This is the stage where you will hear a lot of meowing, which is very normal for a cat. Rub the shampoo gently and avoid using too much shampoo. The rinsing part requires some effort from your side. Shampoo left on his skin will make him scratch itself leading to skin irritations. Drain water from the tub, while draining slowly pour few cups of water on the fur to remove the shampoo. Rinse and rub the fur well before drying. Make sure there are no shampoo residues on his fur. Wrap a towel around the cat while in the tub. Gently start rubbing the body. Excessive rubbing can cause knots on the fur in cats with long hair. Remove your cat from the tub and use another towel to dry him completely. Rub as much water possible from the fur. You can even use your blow dryer to completely dry his fur, but make sure the sound doesn’t scare your pet. Set the dryer on low speed first to see if your cat can tolerate it. Use a cotton ball to clean the insides of his ear. It is normal for cats to start licking immediately as it is natural for them to lick to dry themselves whenever they come in contact with water. Washing cats is extremely stressful for the owner as well as for the cat. All efforts need to be made to keep the whole process enjoyable for both of you. If you keep all the things required for a cat bath handy half of the stress is eliminated and giving cats a bath becomes enjoyable. Next articleDo Cats Eat Roaches and It is Safe for Them?